5 kiosks on five lamp poles each show three interconnected photographic animations, printed on successive flaps of train flap signs. 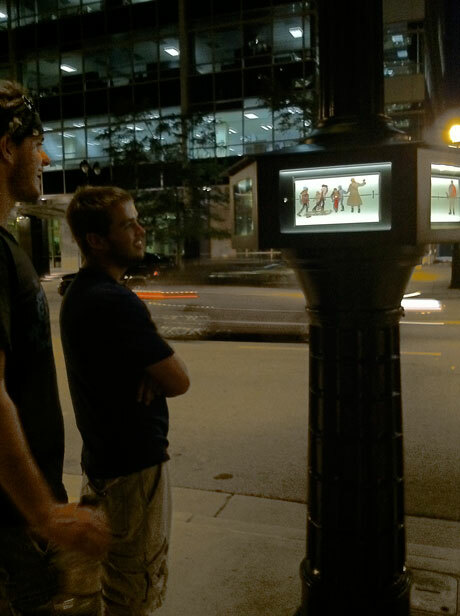 The flaps turn and display the dramas like a flip book.They are triggered by motion detectors when pedestrians pass by. 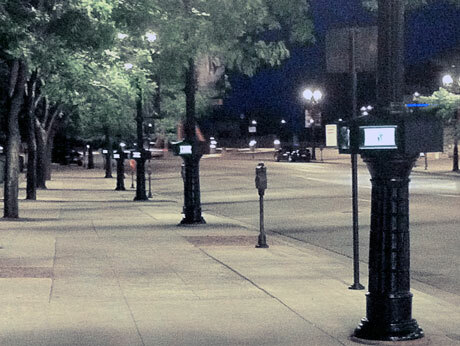 Commissioned by the City of Milwaukee and the Wisconsin Department of Transportation. 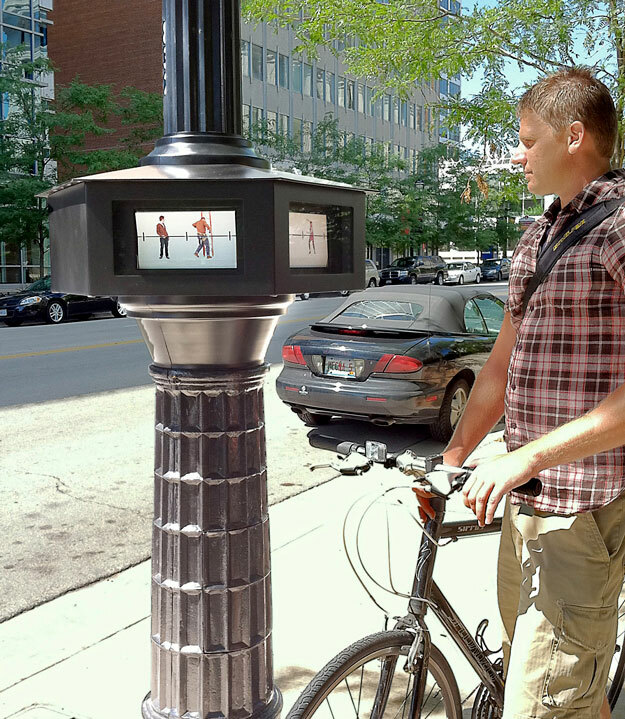 on 5 existing lamp poles, each kiosk: 2'10" X 2'10" X 1'9"
aluminum, Solari train flap units, photographic animations, electronics, mechanical parts. 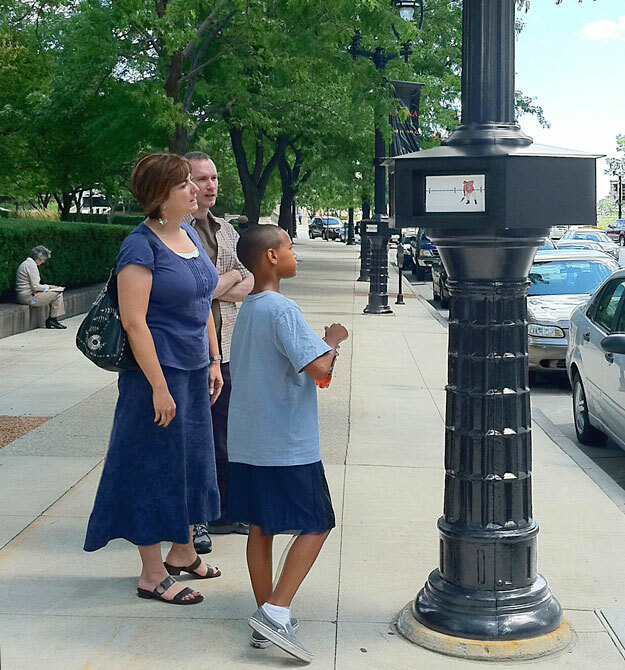 This project was a collaboration with more than 100 Milwaukeeans. We held a contest for ideas for the dramas, hired directors and performers, both professional and amateur, and filmed the dramas in Milwaukee. Each flap unit has 60 images; each of the 5 kiosks has 3 flap units; there are 900 still photographs in all. To make the still shots, we shot 7 frames per second of live action in a studio setting under bright lights to freeze the motion. In Brooklyn, we edited the sequences, retouching all 900 images, and printed them on vinyl.